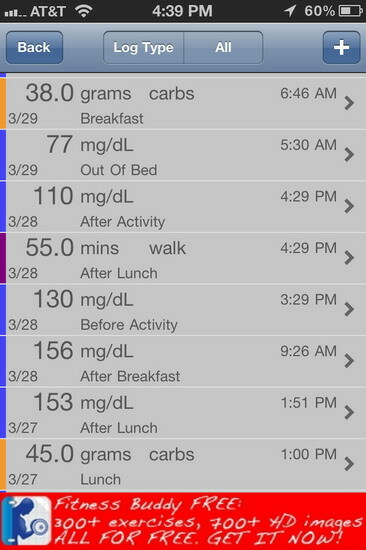 Glucose Buddy is a popular iPhone App for logging information relating to the management of diabetes. This review is on version 3.6.5 last updated on May 7, 2011. It was tested on an iPhone 4S using iOS 5.1. The application has a 4+ rating in the iTunes store with consumer reviews mostly positive. The majority of the lower ratings are due to the integration with the CalorieTrack food logging app which is, at this time, awful. The positive reviews focus on the ability to log glucose readings and e-mail or print logs and graphs and the benefit it brings them. While the logs are easy to e-mail and print, there are serious cross browser compatibility problems with graphs and the graphs are limited in detail compared to similar applications. I also found parts of the app that simple don’t work. The application has many features not found on other similar application. You can access and participate in the online forum from within the app. I feel community support is important in effective diabetes management and this app does a great job at letting forum user keep in touch without the need of a computer. The app features an alarm module which can be triggered from events within the app such as a timer that starts after all after breakfast events. Being consistent with post meal glucose readings is hard sometimes if you forget to start a timer. This app will start the timer based on your configurations. A nice feature that I found very useful. The app is free for an ad supported version and upgrades are available to remove the ads and add increased functionality. The home page of the application is well laid out and easy to understand. Under the My Info section you can set date of birth, gender, type of diabetes, height, weight, your e-mail address and that of someone to send your logs too. 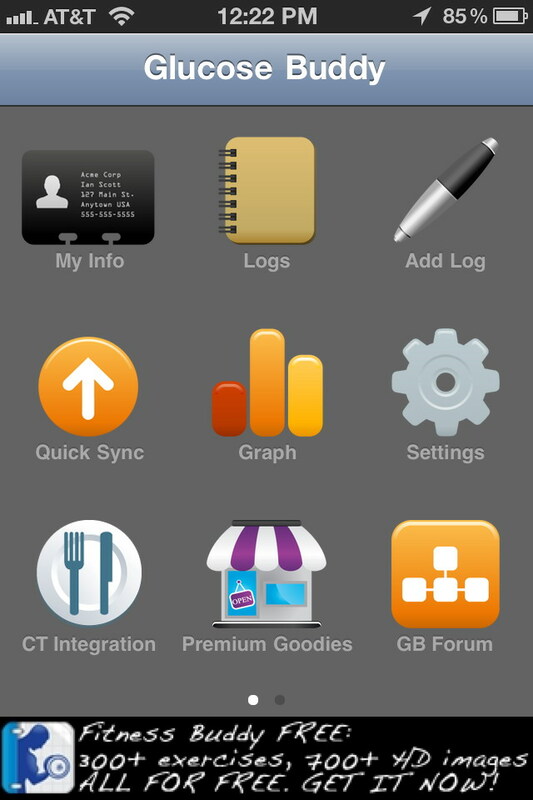 In the My Tools section you can record the make and model of your glucose meter, insulin pump and CGMS (continuous glucose monitoring system). Well at least you’re supposed to be able to record that information. I was unable to do so because when I tried to select the model of my glucose meter, the scroll wheel would snap back to the default position and not allow me to select my meter model. 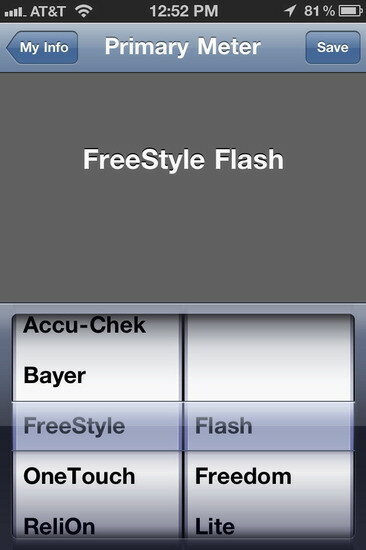 No matter how hard tried to select my FreeStyle Freedom meter, the scroll wheel always went back to the Flash model. The same problem occurred on the pump and CGMS selections. The log section has a large display with each log entry easy to read. On the left side of the log there are small color vertical bars which indicate the type of data on each line. Blue for glucose reading, orange for carbs, purple for exercise and green for medications. I think it would be better if those color bars where bigger or the whole bar background was in color. The text is black on a grey background which might be an issue for someone that needs high contrast to read text but should be fine for most users. Over all the user interface is clean and easy to use, even though some parts don’t work. The parts that don't work are annoying but they occur in sections I don't think critical for most users. I am not sure why you even need to record which meter you are using.